Exquisite Banana: Why, Bees, Why? Came home yesterday to a swarm of 100+ bees on the roof and about 30 more inside of our house. Fun stuff, guys. Did you know bees act drunk when they are about to fall asleep on your kitchen floor? Or that a hive can fully operate inside the wall pipes of your guest room? Yeah, me either. We may be temporarily kicked out of our house if these ballsy buggers continue to make themselves comfortable. So, goodbye for a day or two. I'm off to kick some bee booty. Or perhaps just scream and cry. We'll see. Also, I'm learning a lot. Would be fascinating if it weren't so frustrating. Oh my goodness, not fun at all. I'm pretty sure I would have flipped right out if I came home to that. Hope you're able to get them to leave and quick! Oh yikes!!! If it makes you feel any better, I learned all about swarming termites and stinkbug habits when we moved into our new home. Fun times. All has been resolved though---so stay strong! Oh my goodness, Kayla! That's crazy. I would be screaming and crying and just generally freaking out, that's for sure. 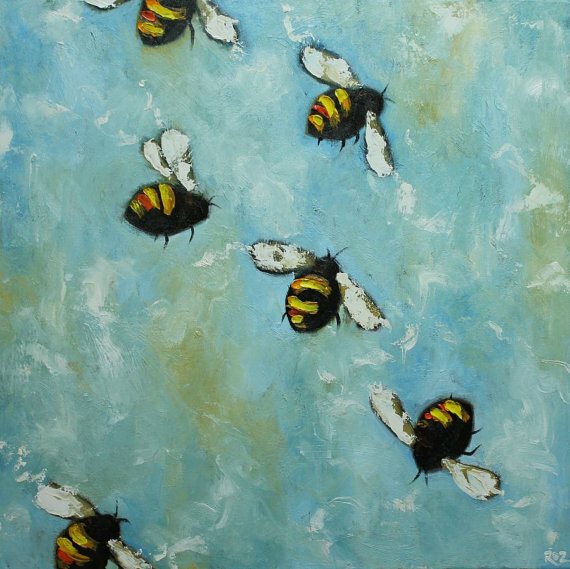 On the plus side... that's a cute bee painting. Oh sweetheart, I'm so sorry! I hope everything clears up quickly, and that you guys get your wonderful little house back-quickly! the worst! I'm sorry love, how frustrating. on topic, did you see the trailer for the bee documentary narrated by ellen page? fascinating. oh my goodness! i've never heard of such a thing, that's so weird. i hope you can get things taken care of soon and without injury. scary! or maybe you can train them like circus bees? they could make you honey, do your laundry and scare away solicitors. are there circus bees? I do hope they're friendly honey bees and someone can remove them safely. They can live in wall pipes? By golly, who knew?! Oh no, definitely not what you want to find on your return home. Am I the only one who is bee-friendly here? :-) I obviously never had a bee infestation in my house but when you think about it, too much of ANYTHING in the house is bad, even if it is a swarm of cute little puppies. From all the nasty bugs that can invade my house (and I learned a LOT about those living on the first floor in Jersey! ), the bees are at least smart, helpful for nature and don't transmit diseases. Hope you're not allergic to them though. Hope you get rid of them soon though. Just bee-cause they're not too compatible with humans!